The economic, social and personal benefits of public art are widely recognized. 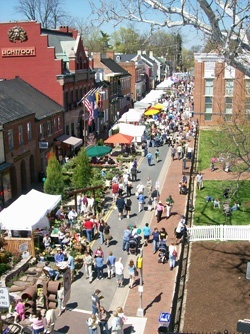 Prime examples include the fairs and festivals that bring business to downtown Leesburg, in addition to bringing education and joy to residents and visitors. Rotarian Valerie Beaudoin introduced architect and arts supporter, Tom O'Neil, who shared his stories and excepts from a strategic plan for public art with the club on Thursday, March 3, 2016. Tom is the current chair of the Leesburg Commission on Public Art. During Q&A, members provided suggestions for murals on walls such as the VFW building, and voiced support for ideas he presented to promote and help make Leesburg more attractive. Several members expressed surprise that the Town of Leesburg does not fund any public art. Members shared examples of towns and cities that benefit from public art murals and other initiatives, including nearby Frederick, MD, Winchester, and Richmond.